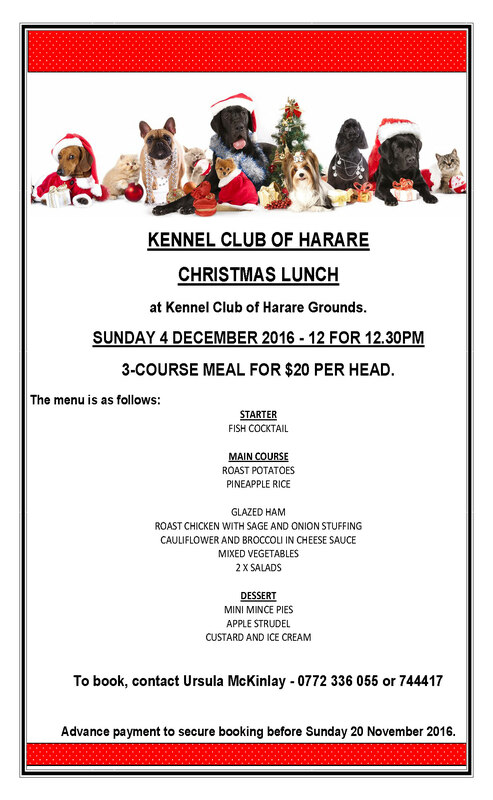 This year, our Annual Christmas Lunch will be held at the Kennel Club Grounds on Sunday 4 December 2016. There will be no training on that day. Come along and have fun with your dog. Plenty of games (suitable for both puppies and adult dogs) and dog jumping fun for the dogs and their handlers. Time – 8.30 am for 9am. Please bring a plate of snacks. Sunday 18 December 2016 – the Club will be open as usual. Sunday 25 December 2016 – Christmas Day – the Club will be closed. Sunday 1 January 2017 – New Year’s Day – the Club will be closed. Sunday 8 January 2017 – the Club will re-open. This entry was posted in Fun, Kennel Club Event on 27 November 2016 by Ilse van Erp.